Did you know that Pluto is not considered a planet of our solar system anymore? Yes, in 2006, its career ended as a full-on planet after more than 75 years (as it was only discovered in 1930) because it doesn't fulfill the criteria of a planet. It's now considered a dwarf planet. My 5-year old son is learning about our solar system in school these days and Pluto was not part of it anymore. The other day, the last question before my boy went to sleep was how the earthquake in Japan came to happen. Fortunately, geography was one of my favorites subjects when I was in school, so I managed to explain that off the cuff. But I was at a total loss with the Pluto question. Was that on the front pages of the newspapers back in 2006? I wonder. My mom is a teacher for biology and chemistry. She recently explained to me the biochemical background and connection between low kidney function and potassium levels. It feels like I am sitting on the school bench again. And you know what? I am enjoying it. It's random things that don't seem very important in everyday life, as you run your errands. But it makes me sit down for a moment and engage my brain with something different. Something that goes beyond remembering what groceries need to be bought, the husband's weekend work schedule, or organizing the family's summer holiday. It makes me stop and realize it is nice and cozy in my little cocoon. But there is a whole world out there that is amazing and full of wonders. You just have to open up to it. It's not even a question of time. Changing from tunnel view to a wider outlook is all it takes. I remember that I felt empty in the months after I finally got my university degree after years of studying. Suddenly there were no more book piles on my desk, nothing to research. At that moment I understood those middle-aged people and pensioners that I saw at university every now and then. You need to do something, or rather, you should always learn something. All your life. Hopefully, I will be one of them in 15 or 20 years time when my kids are grown up, studying psychology, a science that always fascinated me. Something that can be very psychological, are food cravings. For instance, if you always want something sweet after dinner, always need that caramel popcorn at the movies, as well as eating out of boredom or because you are under stress, these are psychological food cravings. However, if you crave meat, your body probably tells you it needs protein. Craving veggies can point to a deficiency in vitamins. Those are physiological cravings. I am having a meat phase. It's so severe, I even went to a local restaurant PR event with a burger tasting, to get my meat. I don't know where my craving stems from. My running training has reduced itself to a minimum for various reasons. But since I had children, I stopped asking myself for reasons: it's all phases. We don't know where they come from, we don't know when they go. But they will be over at some stage. 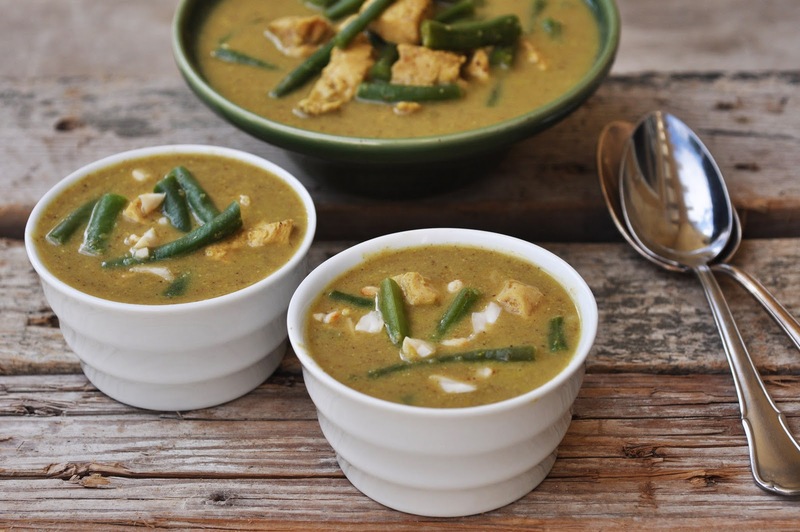 The chicken coconut curry probably ticks all boxes to satisfy physiological cravings: chicken for the protein, beans for the vitamins, and coconut milk and ground almonds for the fats. All good. Dig in. In a small bowl, combine onions, garlic, chili, curry powder, ginger and ground almonds. Mix and set aside. In a large pan, melt the butter over medium heat. Add cardamom, cinnamon, cumin and coriander. Cook for one minute while stirring. Add the onion mixture and fry for 2-3 minutes while stirring. Add coconut milk, chicken and vegetable stock and let simmer, without a lid for about 45 minutes. A few minutes before the end of the cooking time add the green beans. Season with salt and stir in shelled peanuts. Serve with rice.